So many people I know say they hate baking or they can’t bake, or they simply are not patient enough to bake. I get it. But come holiday time, even those who don’t typically bake find themselves baking, especially cookies. 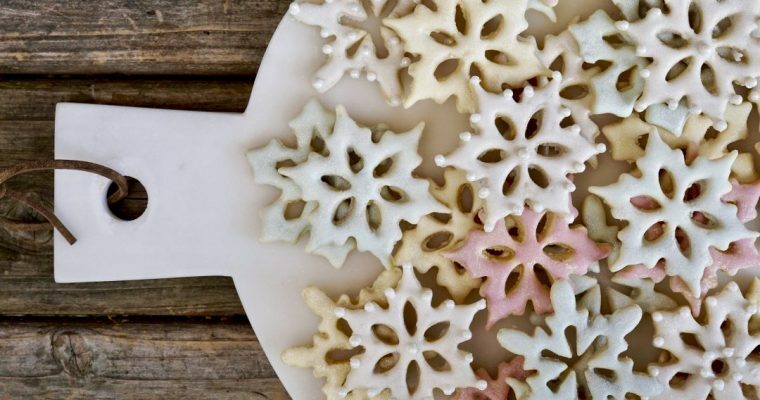 I have fond memories of spending countless hours frosting and decorating sugar cookies. Although I loved this activity, it was exhausting. It was not until I became a mom and began making and baking cut-out sugar cookies that I realized how exhausting this was for my mother! 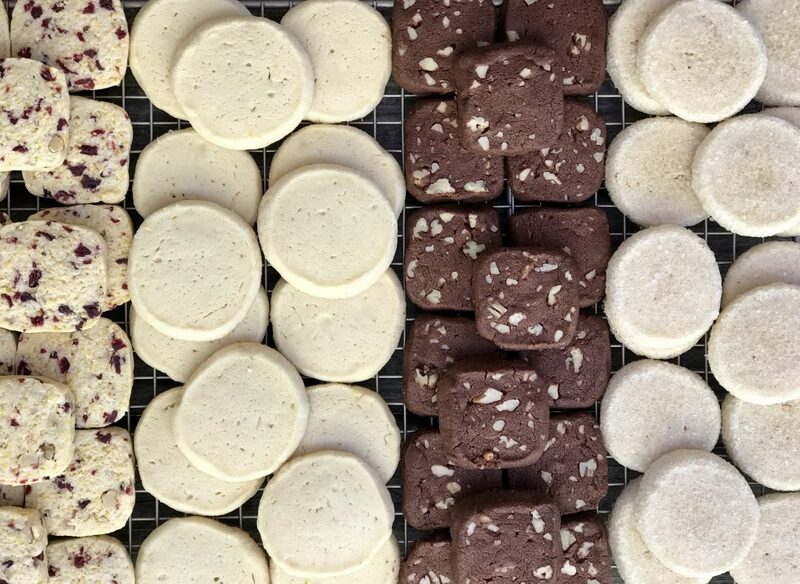 Holiday cookies can be a labor of love, but they don’t have to be so draining and time-consuming either. 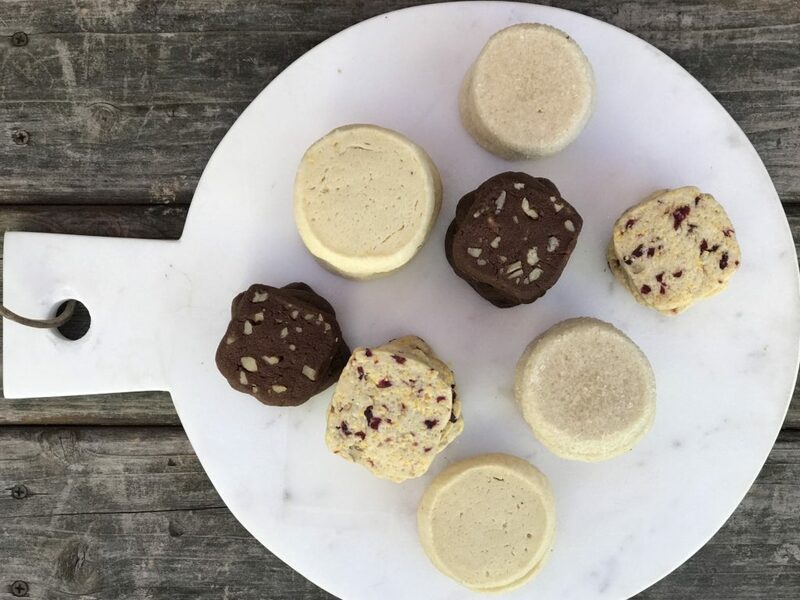 These are icebox cookies, also known as refrigerator cookies. They are super easy. 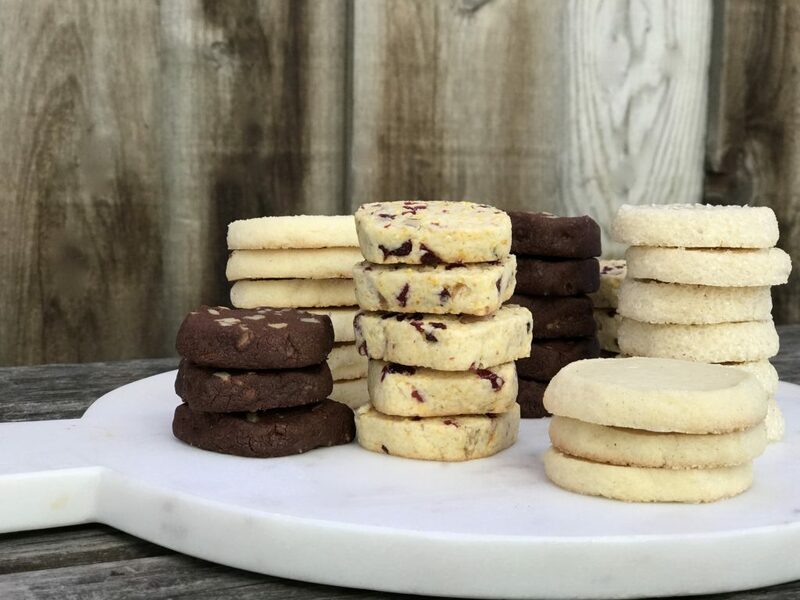 Icebox cookies are simple, straightforward slice-and-bake cookies that are a great option for the holiday season. You can also make more than one kind without feeling like you have been baking forever. Icebox holiday cookies are something my grandmother used to make. She could make different varieties for friends and family as gifts without baking for the entire month of December. She was a smart lady. Icebox cookies are also great in that they the keep their form well. 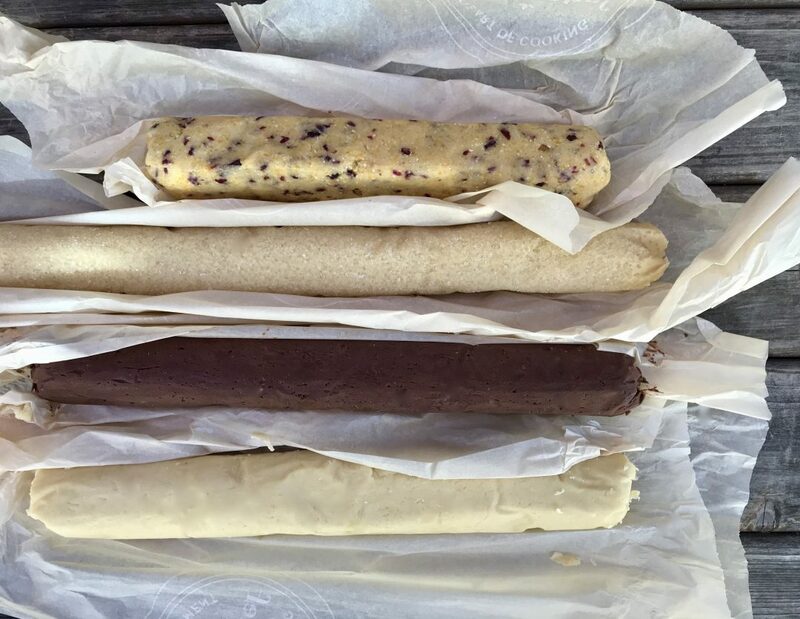 You simply make the dough, roll into a long even log shape, and chill in the refrigerator until needed. This makes them an easy cookie option for busy days, parties and large groups. When you need them, slice, decorate, and bake and within 10 minutes, you have delicious holiday cookies. 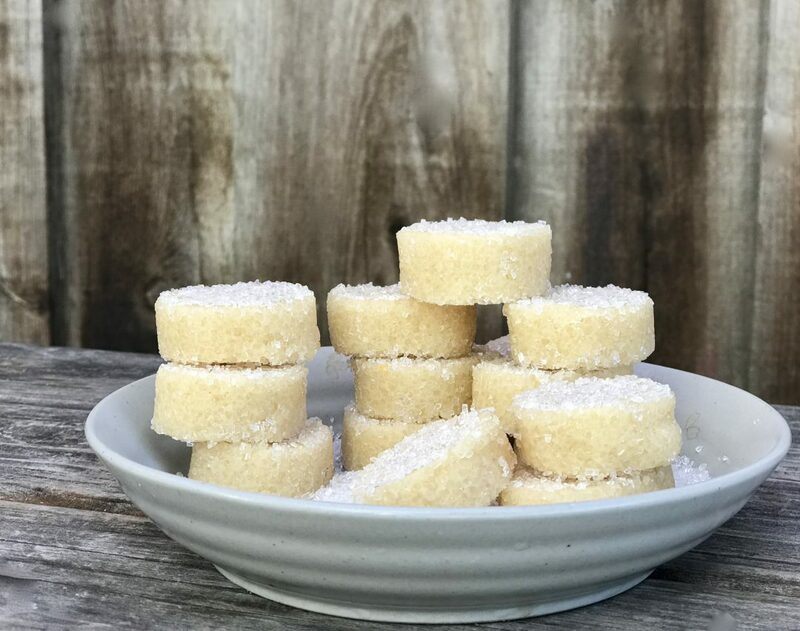 Below are a few of my favorite icebox holiday cookie varieties: classic sugar, cranberry-orange cornmeal, chocolate-pecan shortbread, and lemon. Make your holiday prep just a tad bit easier this year with these recipes for easy flavorful slice-and-bake cookies. Step 1 In a medium mixing bowl add the flour, cornmeal, baking and powder. Mix well and set aside. Step 2 Using a kitchen mixer, such as a KitchenAid fitted with a paddle attachment, add the butter and sugar and blend on medium until light and fluffy. Reduce the speed to low and add the egg, vanilla extract and the orange zest. Step 3 Add the flour mixture. Step 4 Add the cranberries and walnuts and mix until just blended. Step 5 Transfer the dough to a long piece of parchment paper. Using your hands, roll the dough into a long even log shape. Wrap the dough in the parchment paper. Leave the dough as is or use your hands to gently flatten the top and sides to allow for a more square shape cookie when sliced if desired. Twist the ends of the parchment paper to create a secure closure. Refrigerate the dough for at least 1 hour. Step 6 Preheat the oven to 350 degrees F. Line two baking sheets with parchment paper and set aside. Step 7 Remove the chilled cookie dough from the parchment paper and place on a cutting board. Using a slicing knife, cut the dough into 1/4-inch thick slices. Step 1 In the bowl of a kitchen mixer, such as a KitchenAid fitted with a paddle attachment, add the butter and sugar and mix on high till light and fluffy. Step 2 With the mixer on low, add the egg, vanilla extract and pinch of salt. Add the flour. Mix until just combined, but be careful not to over-mix. Step 3 Transfer the dough to a long piece of parchment paper. Using your hands, roll the dough into a long even log shape. Step 4 Carefully place 1/3 of the sprinkles on the parchment paper and spread out as long as the dough log. Gently roll the dough through the sprinkles pressing down gently as you go to adhere. Repeat until all of the dough is covered in sprinkles. 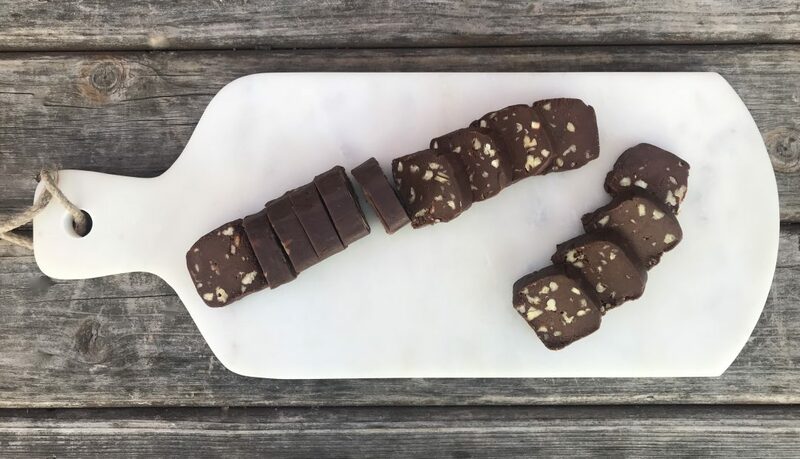 Discard any remaining sprinkles and wrap the dough in the parchment paper twisting the ends of the parchment paper to create a secure closure. Refrigerate the dough for at least 2 hours to set. Step 5 Preheat the oven to 350 degrees F. Line two baking sheets with parchment paper and set aside. 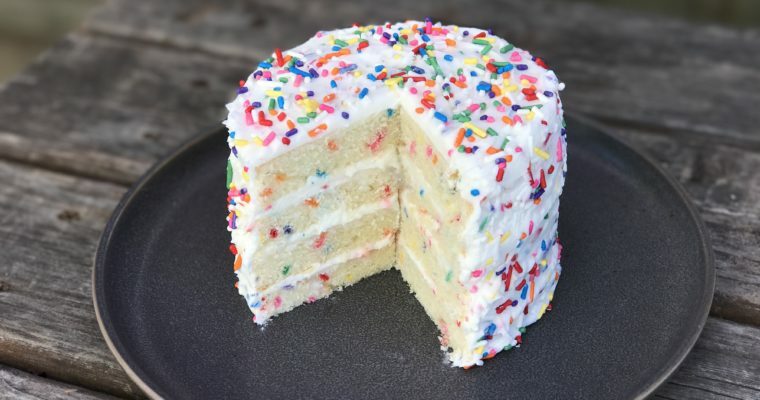 Pour the remaining 1/3 cup of sprinkles on a small plate and place near your work space. Step 6 Remove the dough from the parchment paper and place on a cutting board. 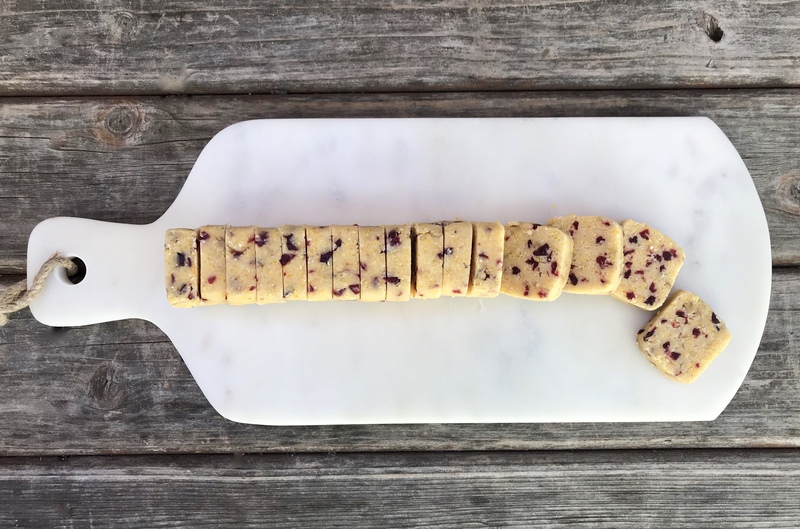 Using a slicing knife, slice the dough in 1/4-inch thick slices. Gently dip the cookie slices in the sprinkles to evenly coat the entire cookie. Place the sprinkled covered cookies on the prepared baking sheet with a little bit of space in-between. Note, these cookies do not spread very much when baking. Step 7 Bake the cookies for about 10-12 minutes until they are just set, but there is no browning. Cool cookies on wire racks. Step 1 In a medium mixing bowl add the confectioner sugar, flour, and cocoa powder. Mix well to incorporate. Step 2 Add the butter and the vanilla extract. Using a wooden spoon, mix well to incorporate. Fold in the pecans. Step 3 Place the dough on a long piece of parchment paper. 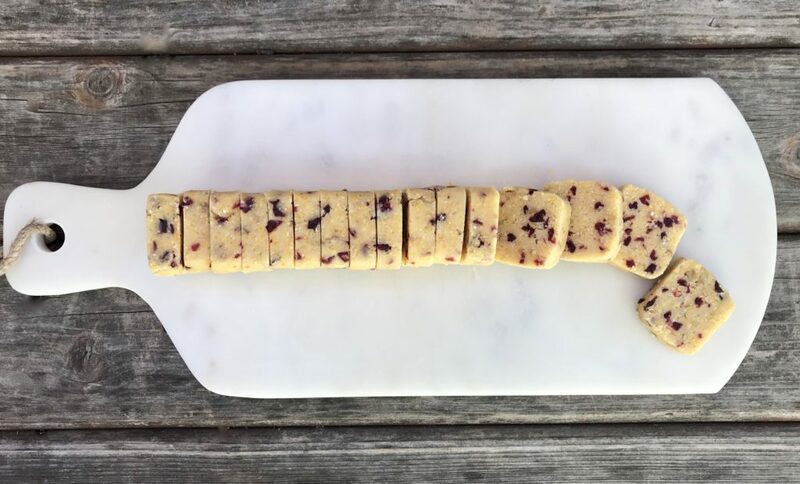 Using your hands, roll the dough into a long even log shape. Leave the dough roll as is or use your hands to gently flatten the top and sides to allow for a more square shape cookie when sliced if desired. Twist the ends of the parchment paper to create a secure closure. Refrigerate for at least 2 hours. Step 4 Preheat the oven to 325 degrees F. Line two baking sheets with parchment paper and set aside. Step 5 Remove the chilled dough from the parchment paper and place on a cutting board. Using a slicing knife, cut the dough into 1/4-inch thick slices. Step 6 Place the sliced cookies on the prepared baking sheet with a little bit of space in-between. Note, these cookies do not spread very much when baking. Place in the oven and bake until firm to the touch, about 12 minutes. Cool the cookies on wire racks. Step 1 In a kitchen mixer, such as a KitckenAid fitted with a paddle attachment, add the flour, confectioners sugar and salt. Mix well to incorporate. Add the zest and lemon juice. Step 2 Add the butter and vanilla extract and mix well to incorporate. Note, mixture will look like a course sand. Step 3 Add the egg and egg yolk and blend. Step 4 Transfer the dough to a long piece of parchment paper. Using your hands roll the dough into a long even log. Roll the dough up in the parchment paper. If desired, pour the sugar on the parchment paper and spread out as long as the dough. Gently roll the dough through the sugar pressing down gently to adhere. Repeat until all of the dough is covered lightly in sugar. Discard any remaining sugar. Twist the ends of the parchment paper to create a secure closure. Refrigerate for at least 2 hours. Step 5 Preheat the oven to 350 degrees F. Line two baking sheets with parchment paper and set aside. Step 6 Remove the chilled cookie dough from the parchment paper and place on a cutting board. 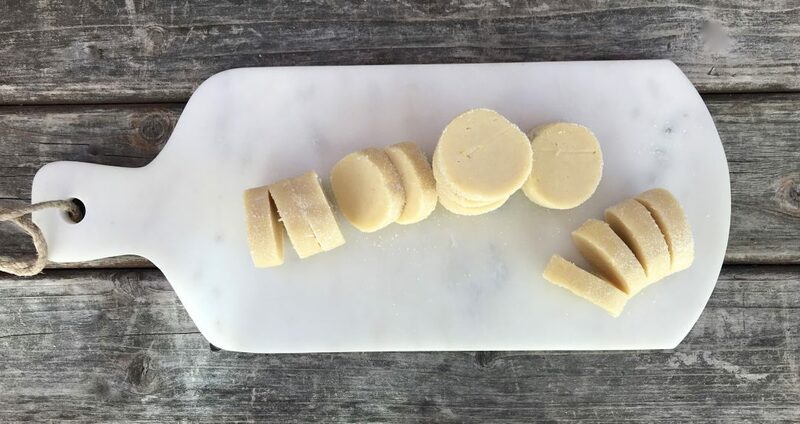 Using a slicing knife, cut the dough into 1/4-inch thick slices. Step 7 Place the sliced cookies on the prepared baking sheet with a little bit of space in-between. Note, these cookies do not spread very much when baking. Place in the oven and bake until firm to the touch, about 15 minutes. Cool the cookies on wire racks. Just made two batches of these, the boys can’t wait to eat them! Thanks Erin, this makes me very happy. It is wonderful that you recall – and honor – the memories and cookie- making abilities – of your mother and grandmother. I am so proud of your baking talents and I suspect Grandma Helen is smiling down happily watching your efforts too. Great job, thanks for sharing. Love, Mom.